This week saw the winner of the Stella Prize announced. 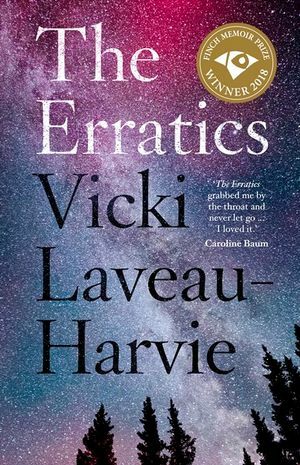 Canadian born, Sydney based writer, Vicki Laveau-Harvie won the prize for her memoir, The Erratics. Melbourne based readers can see her in conversation at The Wheeler Centre. The Erratics, by Vicki-Laveau-Harvie, winner of the Stella Prize 2019. It’s also good news for aspiring writers and novelists this week as The Richell Prize for Emerging writers is open again. This is the fifth year of the prize and the winner will receive $10,000 in prize money and a year’s mentoring with one of Hachette Australia’s publishers. What are you waiting for? Or, maybe you’re finishing your undergraduate degree and have a short story sitting in your bottom drawer? If so, the Monash Undergraduate Prize for Creative Writing is for you! In other writing related news, Laura Elizabeth Woollett explores what it’s like to be a method writer in a startling honest piece, discussing what it’s like to inhabit a character’s tastes—from clothing to food to music. She discusses her creative processes and whether method writing is a sustainable practice. While you’re on the KYD website, don’t forget that the 2019 KYD Unpublished Manuscript Award is now open for submissions too! Award-winning visual essayist and poet Eloise Grills writes beautifully about appetite and control in Hunger Cues, a personal essay that questions and examines our relationships to food, hunger, and our bodies. Weekend long reads this week also include a piece by Rebecca Solnit, who writes about what happens when the hero is the problem. Indeed, this is important terrain to cover as single hero stories can often concentrate on one figure and push everyone else onto the sidelines. As Solnit writes, ‘our largest problems won’t be solved by heroes…they’ll be solved, if they are, by movements, coalitions, civil society’. Over on The Guardian, Josie Cox writes about the gender pay gap and how there are no quick fixes. Women still face pay gaps in every industry, as reported here. However, in some positive news this week, the Tasmanian parliament is bringing new laws into effect that will allow a gender diverse person to self-determine their gender identity and have this identity recognised on their birth certificate. For our art lovers out there, be sure to check out the Dark Water exhibition by Perth-based artists Erin Coates and Anna Nazzari. As always, Happy Weekend and Happy Reading!